As Chief Executive Officer of Allied Universal, Steve Jones presides over Allied Universal companies and their respective divisions. He was previously CEO of Universal Services of America, which merged with AlliedBarton in 2016 to create Allied Universal, the largest security services company in North America. Under his leadership, Allied Universal has grown from $12 million in revenue to more than $5 billion and has acquired over 55 companies from 2011 to 2018. 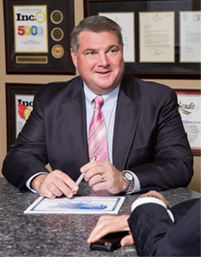 Jones began his security career with Universal Protection Service in 1996, after holding executive level and management positions within two Fortune 500 companies. Honors include being named the top job creator for two consecutive years by Inc. Magazine, winning the Vistage International Leadership Award, and earning the prestigious Ernst & Young Entrepreneur of the Year Award. Additionally, he is a member of the Young Presidents’ Organization and serves on various boards, including that of Allied Universal. Jones holds a Bachelor of Arts degree in Political Science from California Polytechnic University, San Luis Obispo, and an MBA from the University of Redlands.